In a Twitter-friendly 140 characters, Birdhouse focuses solely on drafting, editing, and posting tweets, but not for reading them. Rework Your Tweets: Birdhouse provides a space to craft and perfect your Twitter posts before sharing them with the whole world. Luckily, Macworld.com gives me a few more characters to work with. Birdhouse, the sole iPhone offering from Sandwich Dynamics, is a $4 tweet-composing application. It’s meant to be used in tandem with your “regular” Twitter client, since Birdhouse can only be used to write posts, not read them. No, I’m not joking. Twitter isn’t for everyone (yet). And Birdhouse is for even fewer “everyones” than Twitter… But that’s OK. Birdhouse is focused on an audience of Twitterers who prefer to craft their tweets. That’s clearly not the majority of Twitter users—not the “Thinking of grabbing a Big Mac” or “TOtally drunk lol” or, forgive me, @the_real_shaq crowd. If instead, though, your aim is to ensure that the quips and insights you share on Twitter are as polished and well-coiffed as possible, read on. Once you’ve added your Twitter accounts to Birdhouse (and yes, it supports more than one), the app’s home screen lets you toggle between two views: Drafts and History. Your drafts, of course, are tweets you’ve written but haven’t yet posted. You can rate your unpublished tweets with 1 to 5 stars, and then choose to sort them either by your private rating or the date you wrote them. Composing and editing tweets in Birdhouse is a pleasure. The app sports a large, 18.5-point font as you write, with a 140-character countdown that turns red once you have 10 or fewer characters remaining. Without leaving the Write screen, you can assign a star rating, check when the tweet was created and last modified, and even switch which account you’re writing it for. And if you decide to pull the trigger, there’s also a Publish button which requires a second tap to confirm that you’re ready to share your brief missive with the world. Each element of the interface is elegant and intuitive. 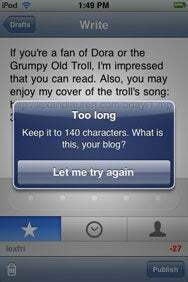 Say It With a Snark: Birdhouse also has a sense of humor, as indicated by this warning message when you exceed Twitter’s 140-character limit. Astute readers—whose attention to detail likely makes them the target audience for Birdhouse—may wonder why the app needs your e-mail address at all. 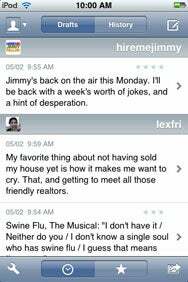 If you provide one, Birdhouse uses it to send you backups of your unpublished tweets whenever you request it. Birdhouse does have some room to go. The app should support landscape mode: I’d assume that most writers who care to take time to hone their tweets to perfection prefer the roomier layout of the widescreen iPhone keyboard. Birdhouse would also strongly benefit from in-app URL shortening; composing tweets with links requires a frustrating dance of switching to Safari to shorten the URL, memorizing your new, smaller version, and relaunching Birdhouse. Though I’m not a designer, I also wonder if Birdhouse might benefit from incorporating a bit more “cuteness” into its interface—the wood grain of its icon might look nice in small doses in the app itself. There’s an undeniable kitschy element to Birdhouse. The app’s creators themselves seem to embrace that kitschiness in their amusing tutorial video. Yet as foppish as the notion of a Twitter notepad may seem, I’ve found that every tweet I’ve composed in Birdhouse is better for it. Whether “better tweets” is worth $4 to you is a decision you’ll have to make for yourself. For the sake of your followers, I hope it is. Birdhouse is compatible with any iPhone or iPod touch running the iPhone 2.2 software update.